Please note that while every effort has been made to provide accurate information, no part of this article constitutes legal advice. The question “Am I too stoned to drive?” is a tricky one to answer objectively. While there are various rules of thumb and gadgets like keychain breathalyzers for alcohol, even lawmakers and police have trouble clearly defining impairment when it comes to weed. To complicate matters further, we live right on a state border here in Vancouver, and there are different rules in Washington and Oregon. That means that it’s technically possible to be good to drive on one side of the river, but not on the other. While police can measure the concentration of THC in a blood sample, it’s really not that simple. Because THC is stored in fat, and because tolerances to weed vary widely, the amount of the chemical floating around in your blood is a poor indicator of how impaired you actually are (orwere). Research suggests that it’s impossible to set a threshold for cannabis impairment. But that hasn’t stopped lawmakers from doing so, at least here in Washington. In the rest of this piece, we’re going to take a look at what the laws say, how they’re currently being enforced, and what to expect if you are pulled over while driving under the influence of cannabis. Finally, I’ll share the results of some field (couch) testing I did with an app called Druid that’s designed to measure impairment from cannabis and other drugs. In Washington, the initiative to legalize weed included a defined concentration, 5 nanograms of THC per milliliter of blood, that constitutes illegal impairment for driving. Police may also use specially trained drug recognition experts to establish evidence of intoxication. Oregon, on the other hand, doesn’t have a quantitative limit to define impairment. Drug recognition experts are used instead in all cases. Police in Oregon may still collect blood, breath, or urine samples for evidence if there is suspicion of impairment. In both states, drivers give “implied consent” to be tested for intoxicants any time they are driving. If someone is pulled over and the officer suspects cannabis impairment (just smelling like weed is enough), they will probably start with some questions about what was consumed and when. Based on the responses and behavior, they may then decide to administer field sobriety tests. If impairment is detected, a drug recognition expert will be called or the officer will obtain a warrant for blood testing. We’ll gloss over some details here about what else might happen during an arrest. From there, court proceedings begin that are best navigated with the help of a qualified attorney. In Washington, if a blood test comes back over the 5 ng/ml limit, DUI charges will definitely be filed. But wait a minute, what about the whole issue of research that shows it’s impossible to set a legal threshold for cannabis impairment? As it turns out, juries are much more friendly towards cannabis users who test over 5 ng/ml than they are towards alcohol users with blood alcohol over %.08. That’s good news for serious stoners everywhere, who may never drop below the legal THC limit in a given day no matter how sober they get. Check out this story from Colorado, where a driver in exactly that situation won their trial. The question remains though, of how cannabis impairment can be reliably measured without the problems seen with blood testing or the subjectivity of human testers. One intriguing answer is to use a combination of software and sensors that in its simplest form just looks like a smartphone. Interest in developing apps for measuring impairment has been steadily growing among academics and even our National Institute on Drug Abuse, which recognizes that existing tests are unreliable and produce false positives. 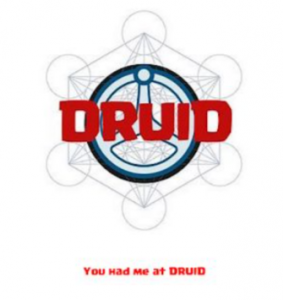 Druid is a first of its kind example of what such an app might look like. 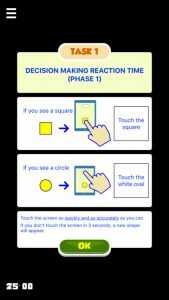 It was developed by Harvard researcher Dr. Michael Milburn and is available for iPhone, iPad, and Android devices. In the name of science, I bought Druid for $0.99 and started putting it to the test. The app has three modes: Practice, Baseline, and Test. Practice is for getting to know the various little games Druid uses to measure your reactions, decision making, sense of time, and balance. Baseline is for gathering data about how you perform sober. Test, finally, is for testing with intoxicants. By comparing baseline and test results, Druid can give you an idea of how impaired you are, theoretically, at least. After a couple practice rounds, I felt ready to get my baseline set. My first baseline was right around 45 (higher scores mean more impaired), which is classified as “Mild Impairment.” According to Druid’s website, it’s normal for initial baselines to be a bit high while first getting to know the app. Or maybe I’m just permanently on that level. The site also says that the data collected so far indicates that users with a blood alcohol content of %.08 typically score between 55-58. Then I smoked some of that Grease Monkey by Ketura Cannabis. While this part of my test was not especially scientific, that’s kind of the whole point: it’s not really possible to just weight how much cannabis goes in your bowl and figure out how impaired you’ll get. Instead, I made sure I got stoned enough that I wouldn’t feel comfortable driving. Then I did a test with Druid and scored 48, “Moderate Impairment.” After cracking and drinking a ~6% IPA, my score was 47, back down to mild impairment (I felt fine to drive at this point). Smoked cannabis tends to peak quickly after consumption, so these results make sense to me. The next day, I did a baseline measurement and scored 44. For a second test, I picked up some Alien Fruity Pebbles from [SKoRD]. This time, I scored a baseline of 41. After smoking to a sufficient level of impairment, I scored 48 again. Then I waited a bit, smoked again, and scored 48. Sometime later when I felt ok to drive, I scored 47. While there’s not a big difference between these results in either test, I was able to convince myself that Druid is a useful tool for measuring my impairment level. This “research” was pretty casual, using different strains and mixing in alcohol, but then again, that’s how life goes. I’d encourage anyone who enjoys intoxicants and operates vehicles to check out Druid. Whether you’re stoned, drunk, or just sleep deprived, it can provide a relatively objective sense for whether you should think twice before getting behind the wheel. Druid comes with a disclaimer: if you feel too impaired to drive, don’t drive, no matter what the app says. Personal judgment is still the best way to gauge your impairment level, though software tools may be the future standard for testing both at home and on the side of the road. In the meantime, many “chronic” cannabis users will be at constant risk of having to prove in court that they were in fact sober, just because they smell like weed.